This recipe for Hungarian Chicken Paprikash -- paprikas csirke -- is from Chicago chef Gale Gand's mother, Myrna Grossman Gand, who inherited it from her own Hungarian mother, Elsie Grossman. Some feel this is "authentic" paprikash because it contains no green peppers and is served over rice, not noodles. 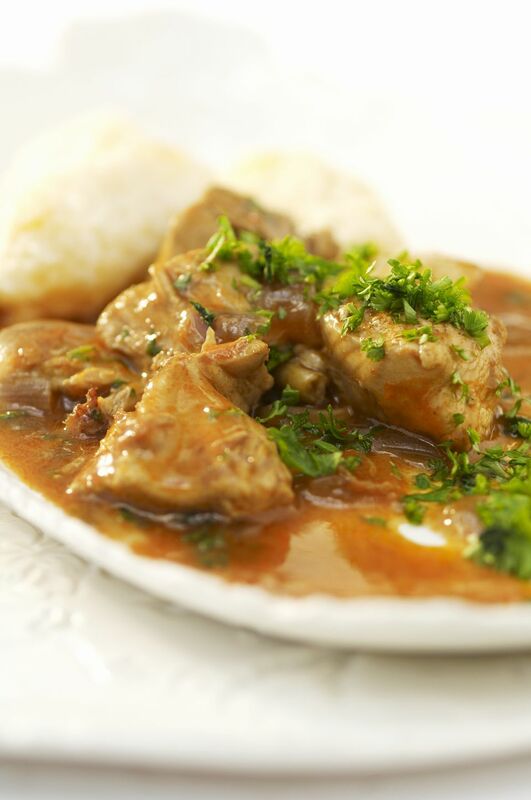 But chicken paprikash varies from region to region and family to family. I don't favor a slow cooker for this dish because the paprika needs to be toasted. Generously season both sides of chicken pieces with salt and pepper and let sit while you saute the onions. In a large lidded skillet, heat shmaltz or oil, and saute onions until light golden brown. Remove from skillet and place in a lidded casserole dish or Dutch oven. Brown chicken pieces on all sides in same skillet onion was sauteed in. Move some chicken pieces aside and add the paprika and cook 30 seconds to toast it slightly. Then add water to almost cover the chicken, mixing in with the paprika. Cover and simmer on low for 1 hour. Heat oven to 350 degrees. Place soaked, rinsed and drained rice in the same casserole dish or Dutch oven as sauteed onions. Measure the liquid from the simmering chicken and add chicken broth to make 4 cups of liquid. Pour over the rice, mixing well. Place cooked chicken on top of the rice, cover and bake 30 minutes. Uncover casserole or Dutch oven and cook another 5 minutes. Serve hot with a green vegetable.